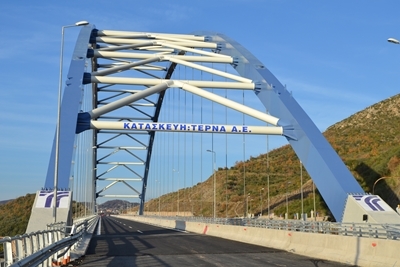 Bridge T4, also known as the Tsakona Bridge is part of the Greek Highway (A7) of the Peloponnese, running from Corinth to Kalamata. 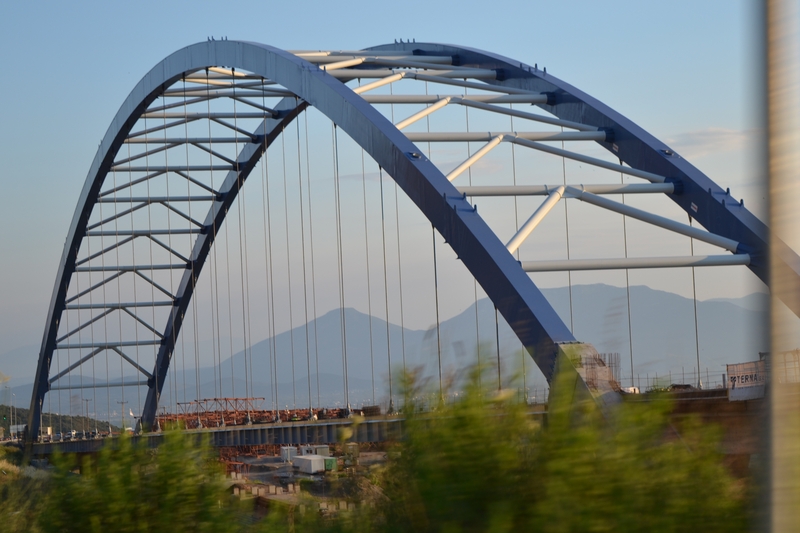 The bridge with a total length of 390m with a 300m maximum span is the second-longest span cable-stayed bridge in Greece (after the Rio - Antirrio Bridge) and is among the world's largest arched bridges. It was necessary to build the bridge because of a huge landslide surface which began in February 2003, causing huge destruction of the road being built. The movement of the soil mass was estimated at 6,000,000m3. The bridge protects the motorway from future movement of the landslide area, which, according to geologists, cannot be excluded. 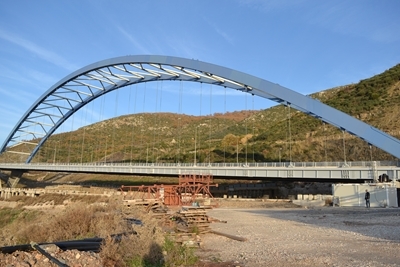 The bridge is a steel arched structure with a cable-stayed deck, combined with part prestressed concrete at the Tripoli end. The deck consists of four lanes, two in each direction with a central traffic island. 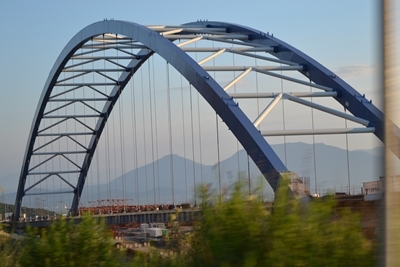 The arched structure, which is a major novelty for Greece, consists of two parabolic arcs connected together with wind bracing elements. The results of the selected and successfully constructed bridging system are huge. The bridge protects the motorway from another landslide, as the soil masses would move like a gravel river under the bridge without hitting it. 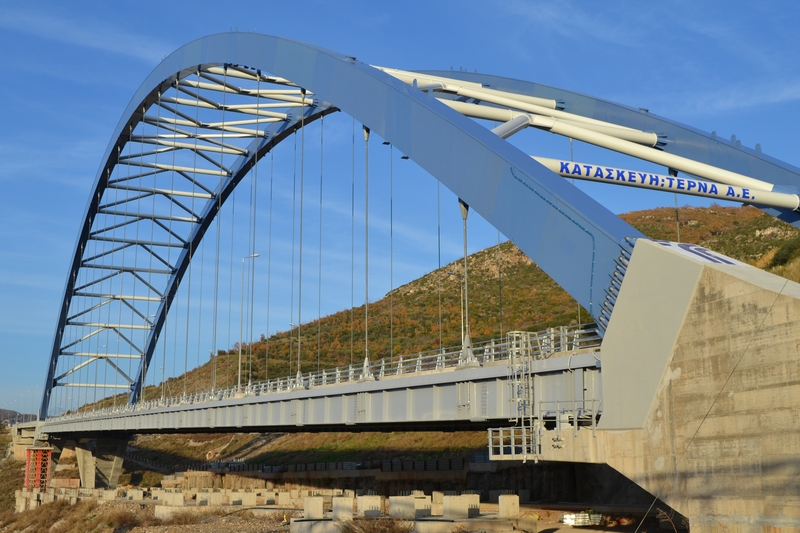 The bridge can safely resist a longitudinal or vertical seismotectonic movement of the southern abutment (towards Kalamata) to 200mm. 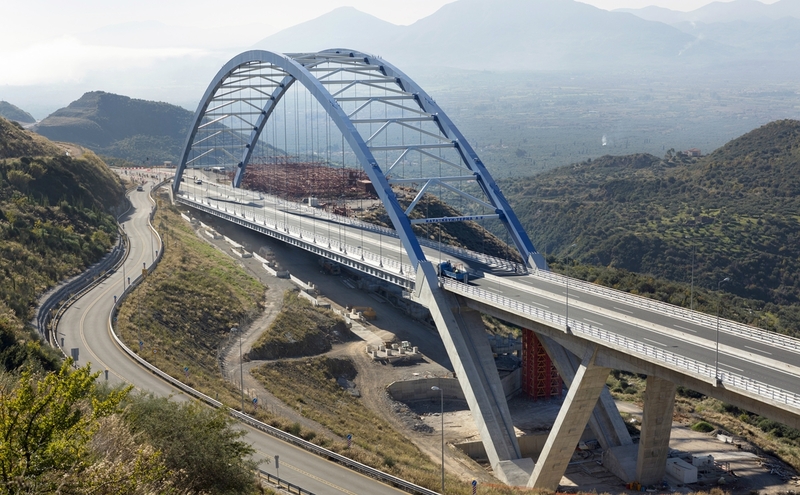 The bridge can survive undamaged the "Earthquake of the Millennium" with a ground acceleration of about 0,30g at the location of project. 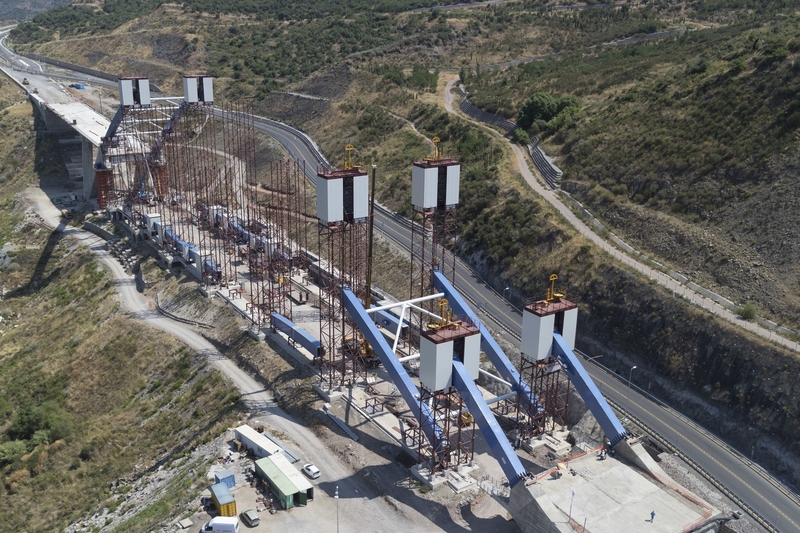 It is possible, without major damage, for the loss of two successive hanger cables due to an exceptional occurrence, as well as the replacement of one of them with continuing movement of traffic in one direction. Due to the significance and size of the project, the bridge is equipped with surveillance and recording systems for the oscillations of the hanger cables, the stress and temperature deformation of the arches and cables and territorial movements. 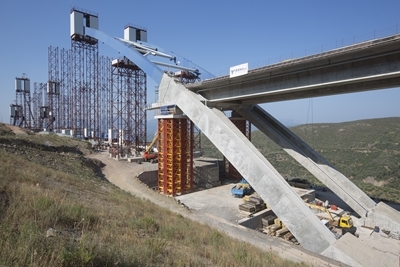 It is also equipped with log seismic accelerations system and complete measuring station for speed and wind direction. 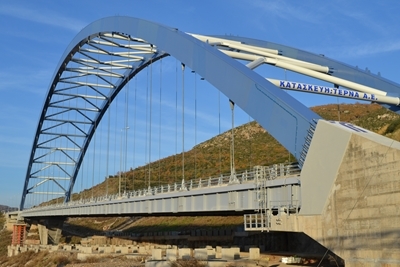 Moreover the whole bridge is protected with its own lightning protection system, it is supplied with electricity for standard operating needs, it has an emergency lighting system inside the arches for inspection needs and finally there is a provision for festive lighting. All designs, architectural, structural, geological, geotechnical were by Greek designers and consultants and the construction was carried by the Greek company TERNA SA, a member of the GEK TERNA Group. For the production of the project more than 600 people were employed (designers, consultants, supervising engineers, third party checkers and inspectors, construction engineers, subcontractors, foremen, operators, technicians, workmen), of which the great majority were Greek citizens. 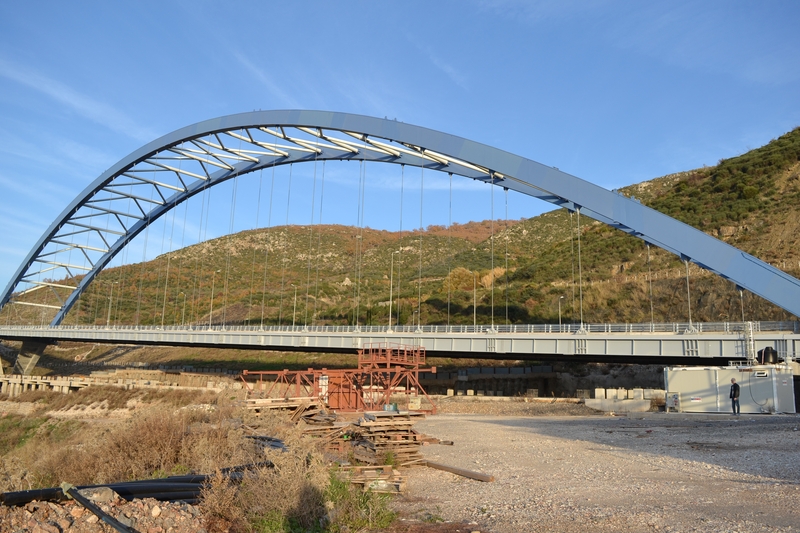 The construction of the bridge arches was a very difficult technological breakthrough because of the thickness and weight of the steel sheets being used. 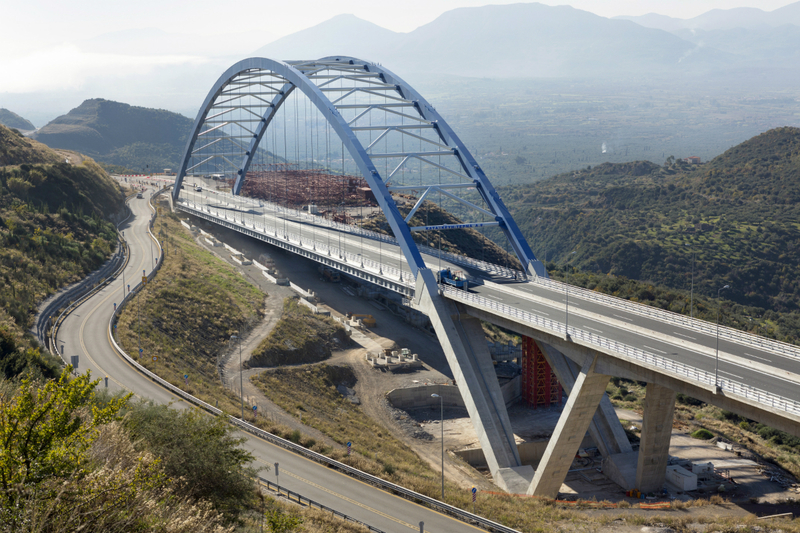 The arches were manufactured at the factory in 12m long sub-segments in order to facilitate the transportation of them, whilst specific methodologies for welding procedures and welding quality control were developed, adapted to the specific structure and huge thickness of sheet steel. 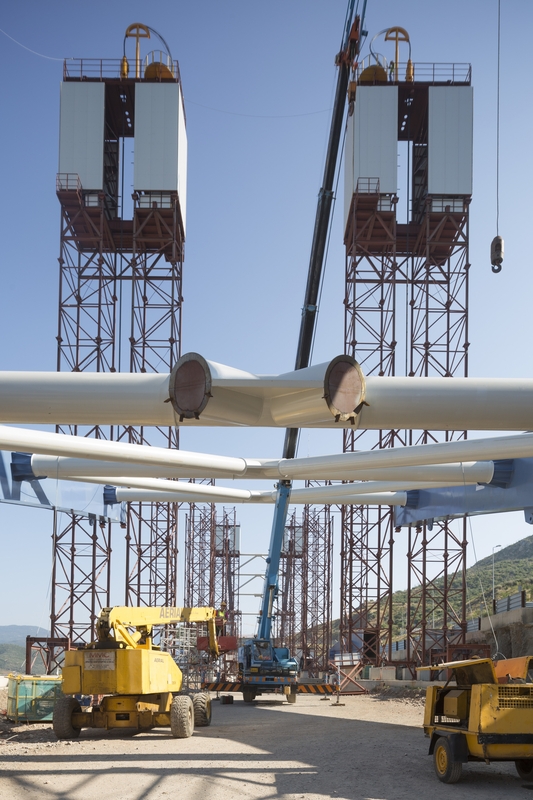 After the construction of the 12-meter sub-segments at the factory they were transported to the construction site, where they were placed on specially designed concrete working platforms and metal bases and then welded three in a row to form 36-meter segments. The lifting and installation of the arches into their final position was a very difficult process. 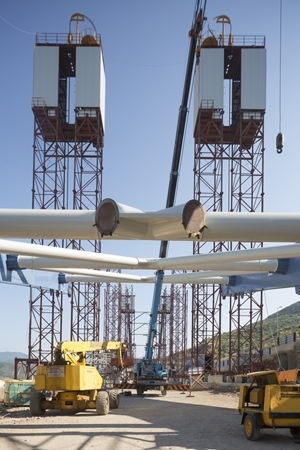 The 36-meter segments were lifted by jacks and metal cables and temporarily rested onto 7 pairs of auxiliary and temporary supporting steel towers of a height up to 60m. After that, they were placed into position by means of other jacks and hoists, then welded together to form one single arch. For this critical welding procedures specific methodologies and quality control were developed, because the welding process at that high altitude and in open space is especially difficult and risky. 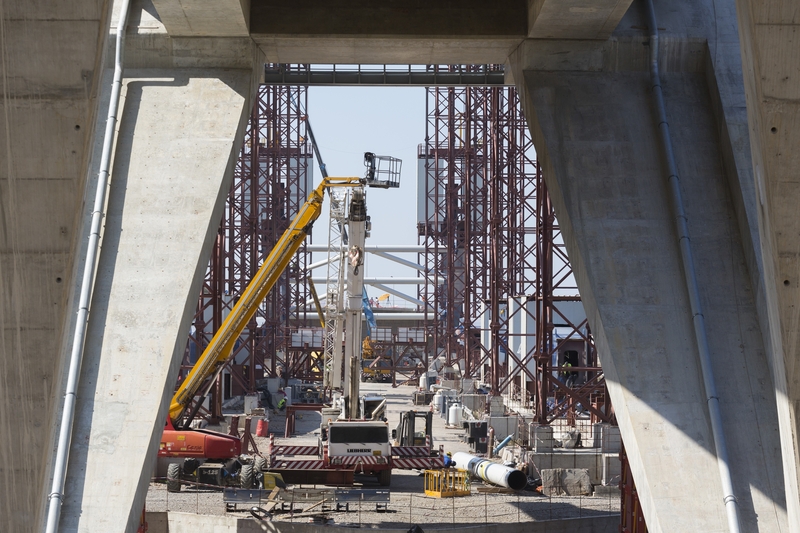 The completion of the welding of the arches on the temporary towers was followed by the "afapsidosi" procedure, which means the release of the arches from the auxiliary towers using jacks, a very delicate - almost "surgical" - process. 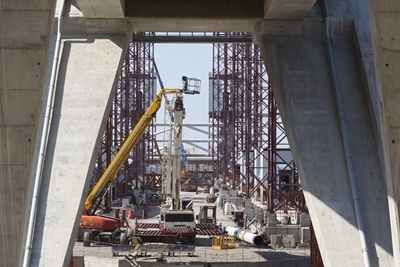 Afterwards, the temporary towers were disassembled and removed; the hanger strands and the metal deck were installed using cranes and finally the casting of the composite slab was completed. 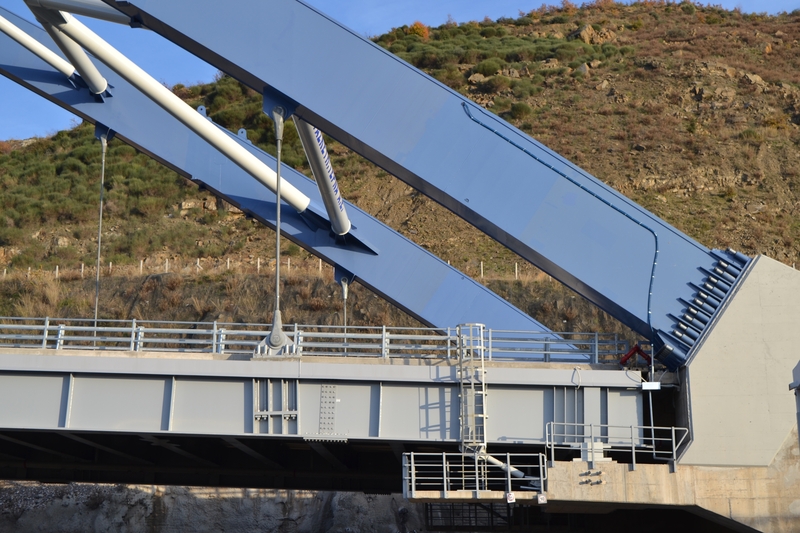 The overall bridge construction budget amounted to 22.850.000 euros including VAT. 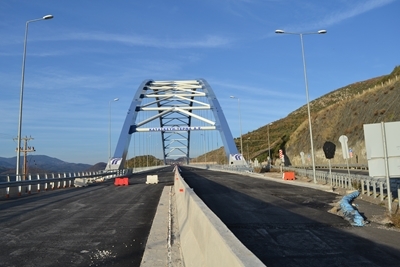 The bridge was opened to traffic in early 2016. 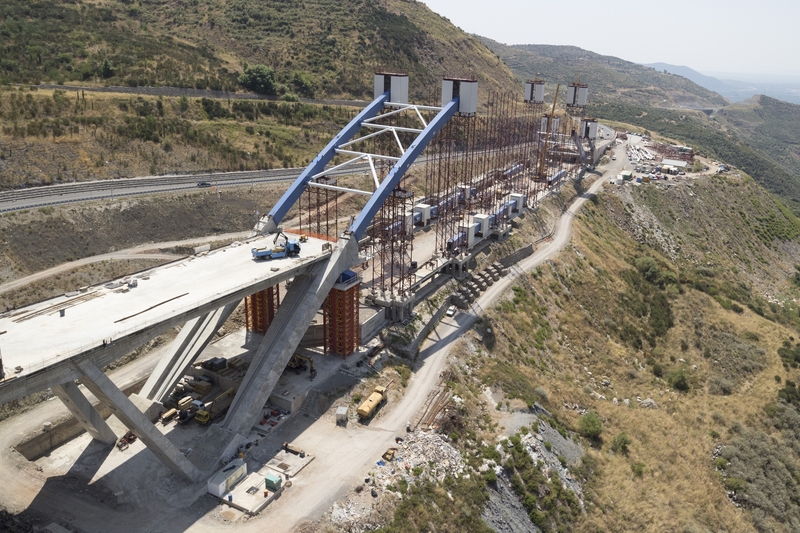 I would like to thank Danae Kalantidi at Terna for all her help in supplying technical information and photographs taken during the construction on the bridge.